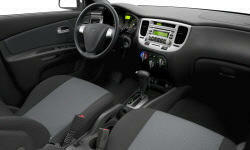 Kia Rio Pros and Cons | Page 1 of 1 | Why Not This Car? What drives people to buy (or not buy) a certain car? 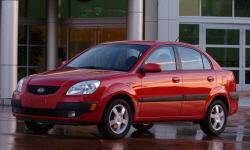 TrueDelta's members share Kia Rio pros and cons based on their real-world driving experiences. One month in Kia Rio rental. Very good fuel econmy. 7 to 8 L/100km over the month I drove it. Temps were quite cold also and there was some idling (warm up) time. Amasing vehicle. It does everything as well as a larger car. All features are as good as or better than most cars regardless of the price. i went in with set price and style i wanted, i got it. insurance was cheap on it. It came with AM/FM/CD, power steering and air conditioning for $6995 for a new car. These little match box cars did very poor in crash tests, and I thought stopping distance was long. The car in base model is very resonably priced in my opinion. Even my LX (ps, ac, am/fm cd) was a great deal. The dealership gave the max. on my trade in (110%) and I drove away with a payment $50 less per month and 2 years less! Dealer could have cared less if I bought the car or not. Fuel economy stays above 30 MPG, even during fast (75 MPH+) highway driving. I could have bought this vehicle for just over $10,000. It had the same options as my Nissan Versa. I get 35mpg with it on the highway. The engine was strong for its size, and the Rio accelerated nicely in highway situations. I never felt that I was wanting for power, even if the engine was a bit coarse.